You may not be aware of it, but there is an alternative to government. There are endless misconceptions about anarchism, which is largely due to a simple misunderstanding of this ideology. When someone brings up anarchy, the response is typically emotional, due to the fact that most people are largely invested in the current system and can’t envision anything to be this drastically different. More simply put, they are comfortable, and imagining an anarchist society is extremely uncomfortable for them. Similarly, voluntaryism is a growling and popular anarchic school of thought, due to its appealing focus on property rights, which will be explained below. For the remainder of this article, I will define and lay out the ideas behind these two philosophies. Anarchy, etymologically, simply means “without rulers.” This is similar to the term “atheist,” whereby the “a” is simply a negation of theism (that is, the belief in deities/gods). More broadly, anarchists wish to see all governments abolished and the fallacious idea of “authority” banished from the minds of men. That is real equality, because rulers seek to impose coercive hierarchies upon the people, which taints the relationships between not only individuals, but also between men and women, blacks and whites, straights and gays, etc. There are essentially two categories of anarchists: propertarians (those who believe in private property) and anti-propertarians (those who don’t). The former participate in freedom festivals and use Bitcoin, while the latter participate in bashing store windows and setting cars on fire, utilizing the Black Bloc technique. Speaking for myself, anarchism means absolute freedom, as long as my actions don’t infringe on anyone else’s person or property. That would place me in the category of a propertarian anarchist, because I think that the State infringes on property rights as a due matter of course. Voluntaryism, previously (and still sometimes) known as anarcho-capitalism, is just one of the many anarchic schools of thought. It is anarchism, but it comes with a bill of wares. 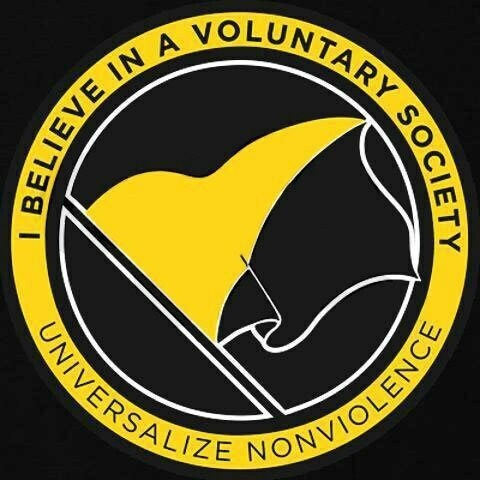 More specifically, the non-aggression principle (NAP), which deems all initiatory force (that is, coercion) to be immoral, and the axiom of self-ownership, which states that each individual is the exclusive controller of his person and property. More simply put, adherents to this ideology believe that all interactions should be voluntary, which is a striking contrast to the State, whose modus operandi is to subjugate its populace through the use of force and coercion, such as through their monopoly on law, which gives them permission to engage in legal plunder of private property; similarly, is the deceptive notion of “democracy” and “voting,” whereby citizens are presented with the façade of getting to choose their masters is likewise coercive, mainly because voters are offsetting the risks of enforcement onto the government instead of honestly forcing their edicts upon their neighbors themselves. Granted, we may not see the abolition of the State in our lifetime, but anarchy already surrounds us. Every day, we all experience it, the spontaneity within our lives. Whether that is a random walk around campus, a snap decision to buy a fifth of Jameson or reaching out to an old friend, it doesn’t matter. There is no central planner; we are left to our own devices—our mind, our impulses, our needs and our desires. No coercion exists there, no justice is to be served and there are no moral judgments to be made, insofar as no other individual’s person or property is damaged; in other words, vices are not crimes. Whether you are dancing in a mosh pit or dating someone romantically, everything involved in those activities is voluntary. 99% of individuals practice voluntaryism every single day, albeit unknowingly. The problem is that government is held to a different standard of morals and ethics. To put it nicely, government itself is immoral and unethical because it initiates force and coerces its subjects into obedience. Here’s the challenge I have for you: for one whole day, be conscious of the decisions you choose to make and who they impact. I would hedge my bets that you try to avoid conflict as much as possible and solve any problems that may arise, peacefully, and without the threat of and/or use of coercion. Now, compare that to the daily operating procedures of government and how detrimental they are to each individual’s life, liberty and property. There will surely be more innocents murdered in the Middle East, peaceful people extorted by gunpoint at the side of the road, personal belongings stolen without due process and surely some other violations of self-ownership, such as taxation. Government is not a “necessary evil,” it is a completely unnecessary evil. 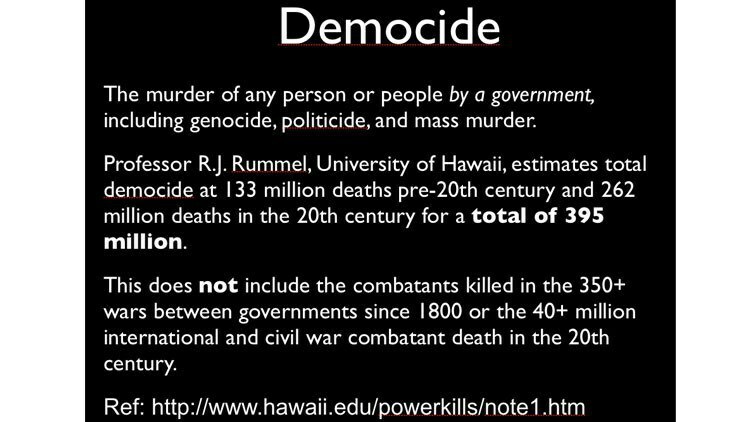 People always claim to be for peace and freedom, and the only way for those two things to exist is to get rid of the most dangerous mass murderer in the history of the world: the State.